Whether you’ve bought a new warehouse or have simply been in your commercial building for many years and have become worried about the structure of your roof, consider these six warning signs your ultimate check list to knowing whether or not you might need a new roof. Water remaining pooled on a roof for more than 48 hours is a sign that your roof is not draining properly. Pooling could be the result of a clogged drainage system, which may be a relatively easy fix. However, it could also indicate the existence of more serious damage, such a buckling and warping of roofing materials. Either of these situations should be addressed immediately as standing water can cause rot, which may affect the structural integrity of the roof. Interior water damage (such as a sagging ceiling, dark spots, and mold/ mildew growths) are signs that your roof is failing to drain properly. If visible water damaged is noticed, an experienced roofing professional should be contacted immediately to assess the situations and recommend a course of action. Flashing is sheet metal trim that is installed over joints on a roof – whether around the perimeter or protrusions – that keeps water from entering the joint. Flashing is particularly vulnerable to damage caused by high winds, so it’s a good idea to check flashing after severe storms. While individual sections of flashing can be replaced, damaged flashing can indicate that water may have entered the roof, causing more serious problems. An experienced roofing professional will be able to asses whether or not this is the case. Blistering (i.e. bumps) on the roof indicate that air and moisture is trapped under the roof’s membrane. Extensive blistering is a serious cause for concern, as the water trapped under the membrane could be damaging to the roof deck. This is an obvious sign that water is able to permeate the roof. Holes and cracks should be addressed immediately, as significant rainfall could enter the crack and cause flooding. If there are large areas of the roof that are discolored, it’s likely that moisture has failed to drain from those areas over a prolonged period. This situation should be immediately investigated by a roofing professional, as this could be an indication of severe water damage sustained over time. While it is important to know if your roof has been subject to wear and tear, it can be dangerous to go on your roof yourself, and you can even end up damaging it even more. 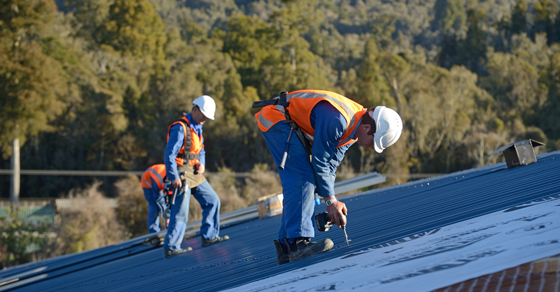 To prevent further damage from occurring, call our team to check your commercial roof for you.